These GPS Fails Are Absolutely Insane! - Muscle Cars Zone! These GPS Fails Are Absolutely Insane! Watching videos of other people failing are always fun and amusing, especially when people make fools of themselves but these GPS fails are so unbelievable that you would have to watch them twice and see whether it is possible to make such massive mistakes. Driving a truck is a no easy task as you would have to make sure that you keep the trailer on the proper spot in order to avoid a crash. 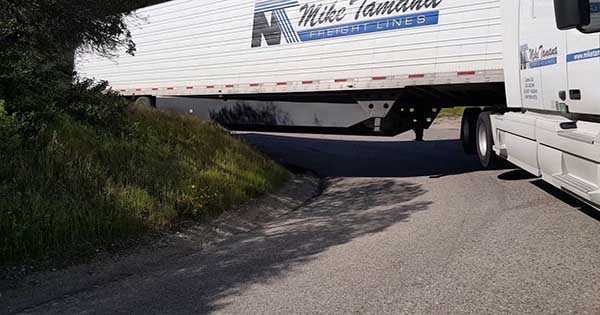 Making sharp turns with such massive trailers is even more difficult and these people failed hard at them. At the start of the GPS fails video we see a semi truck ending up in the water at a very high speed. The footage is from another car’s dash cam and it is a rainy day. We do not know whether the rain caused the crash. Going further down in the video we see what can happen when you miscalculate the angle and the right moment when you are supposed to make the turn. Namely, a truck breaks a pole on the road. Yet there are some people in this video which did not fail, on the contrary, they demonstrated to us how you are supposed to do it. If you want to park you truck and the big trailer in a garage, all you have to do is to watch and learn from the master in a video from the compilation when he does exactly that in just couple of turns. It takes a lot of experience to do it! Finally, we give you the best GPS devices of 2017!